October 27, 2016 – The most powerful telescope orbiting Mars is providing new details of the scene near the Martian equator where Europe’s Schiaparelli test lander hit the surface last week. An October 25 observation using the High Resolution Imaging Science Experiment (HiRISE) camera on NASA’s Mars Reconnaissance Orbiter shows three impact locations within about 0.9 mile (1.5 kilometers) of each other. The scene shown by HiRISE includes three locations where hardware reached the ground. A dark, roughly circular feature is interpreted as where the lander itself struck. A pattern of rays extending from the circle suggests that a shallow crater was excavated by the impact, as expected given the premature engine shutdown. About 0.8 mile (1.4 kilometers) eastward, an object with several bright spots surrounded by darkened ground is likely the heat shield. About 0.6 mile (0.9 kilometer) south of the lander impact site, two features side-by-side are interpreted as the spacecraft’s parachute and the back shell to which the parachute was attached. The test lander is part of the European Space Agency’s ExoMars 2016 mission, which placed the Trace Gas Orbiter into orbit around Mars on October 19. The orbiter will investigate the atmosphere and surface of Mars and provide relay communications capability for landers and rovers on Mars. The separation maneuver, hypersonic atmospheric entry and parachute phases of the Schiaparelli lander’s descent went according to plan, but its thrusters switched off prematurely and the parachute and rear heatshield were ejected earlier than anticipated. Schiaparelli is thought to have fired its thrusters for only a few seconds before falling to the ground from an altitude of 2–4 km and reaching the surface at more than 300 km/h. 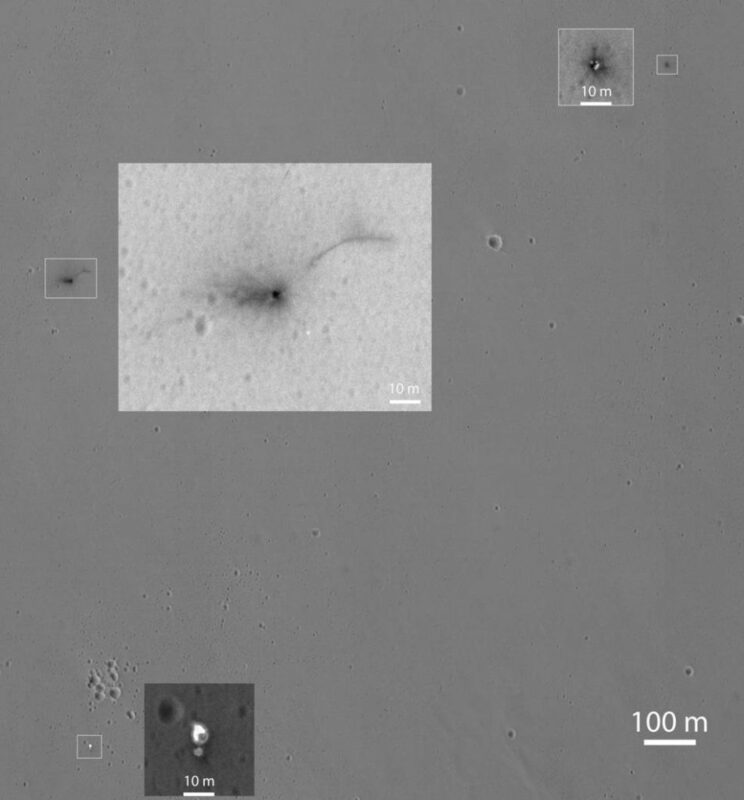 The new images provide a more detailed look at the major components of the Schiaparelli hardware used in the descent sequence and will provide better analysis of what went wrong. Additional imaging by MRO is planned in the coming weeks. Based on the current data and observations made after October 19, future images will be taken under different viewing and lighting conditions, which will use shadows to help determine the local heights of the features and provide a more conclusive analysis of what the features are. A full investigation is underway by ESA and industry to identify the cause of the problems encountered by Schiaparelli in its final phase. A report of the findings of the investigative team is expected no later than mid-November 2016.